Water-supply infrastructure consists of what is built to pump, divert, transport, store, treat, and deliver safe drinking water. In the United States, this infrastructure consists of vast numbers of groundwater wells, surface-water intakes, dams, reservoirs, storage tanks, drinking-water facilities, pipes, and aqueducts . As the figure on page 214 shows, a groundwater or surface-water source (or both) must be available and accessible. Groundwater naturally is stored in underground geologic formations, and is pumped from its subterranean source via a single well or multiple wells. Surface water can be accessed via an intake pipe in a river, canal, large lake, or artificial reservoir. In some rivers, low-head dams may be used to pool the water for more efficient withdrawal. In other cases, large dams have been constructed to impound water on a large scale, thereby ensuring a reliable water supply throughout the year, and from year to year. In areas without adequate supply sources (e.g., some western U.S. states), water must be diverted from its basin of origin to the basin of use. This may involve transporting the water over great distances, and/or across geographic impediments such as hills and mountains. Regardless of the water source, pipes and pumps must be designed to meet the anticipated demand from customers. Municipal water-supply systems use high-capacity wells and intakes, powerful pumps, and large pipes, as well as a power source (e.g., electricity) to drive the pumps. After the raw (untreated) water is obtained, it is treated, if necessary, so that it meets federal drinking-water standards. In the United States, standards are established by the U.S. Environmental Protection Agency (EPA). Treatment plants are designed by engineers to meet site-specific needs of water consumption and water quality. Water may be stored in underground or above-ground tanks. Storage most commonly is used for two reasons: (1) to provide adequate contact time for disinfection; and (2) to provide for peak demand, when customer demand may exceed what the pumping system can supply (e.g., in the morning when most people are showering and preparing breakfast). The last component is the distribution system that moves the treated water throughout the community. The finished water often is stored in treated water reservoirs until it is needed for residential, industrial, municipal, or agricultural uses. Many cities have aging water infrastructures, some as old as 100 years. The structures and materials used in piping systems are reaching the end of, or are exceeding, their life expectancy. Incredibly, some water systems still use asbestos-cement (AC) pipes and wooden storage tanks. These facilities are no longer allowed on newer systems; however, it is common to allow older water systems time to upgrade because of the expense. With these older systems, additional monitoring requirements may be imposed; for example, water systems that still have AC pipe in the ground are required to periodically test for asbestos in the water. Because maintaining and operating aging infrastructure is getting more costly, municipalities have been deferring maintenance while spending money on more pressing needs, and some replace pipes only when they break. Direct infrastructure costs continue to escalate for building, replacing, or improving treatment plants; laying or replacing pipe; maintaining aging dams; and accessing new water sources. Indirect costs also are increasing for expenses such as electricity used to pump the water, and by new equipment made necessary by governmental mandates to treat for additional contaminants . Public utilities also are spending money to protect their water supplies from accidental pollution , changing land uses, and deliberate tampering by vandals or terrorists. The EPA estimates that the expense to repair and replace the water and wastewater infrastructure will be between $745 billion and $1 trillion over the first 20 years of the twenty-first century, excluding the cost of homeland security. The Water Infrastructure Network (WIN) is a group of wastewater and drinking-water service providers, elected governmental officials, state health and environmental administrators, environmentalists, and engineers dedicated to protecting and preserving the drinking-water infrastructure and wastewater infrastructure within the United States. The WIN has identified three core infrastructure needs for the country. 1. The drinking-water supply system, which includes water treatment facilities; treated-water storage and distribution systems; source-water development and protection; water-supply management and interconnection; demand management; and rehabilitation of untreated water conveyance and water storage infrastructure. 2. Domestic wastewater management systems, which includes wastewater infrastructure for collection, pumping, and discharge; wastewater treatment plants; wastewater reclamation and reuse facilities; and biosolids (sludge) management. 3. Stormwater runoff control systems and management practices, which include pollution prevention and reduction practices, as well as runoff collection, conveyance, and treatment facilities. The EPA has been given the important responsibility under presidential directive for working with the water-supply sector (including water and waste-water utilities) to provide for the protection of the country's water infrastructure, particularly the systems used to collect, treat, and distribute drinkable water. These critical infrastructures are fundamental to the public health and welfare. Infrastructures are subject to natural disasters, such as earthquakes and floods, and human-made hazards, such as vandalism and terrorist attacks. Such natural and human hazards could place populations at great risk. In October 2001, as a direct reaction to the previous month's terrorist attacks on New York City and Washington, D.C., the EPA established an internal task force to ensure that activities are completely and efficiently carried out in order to secure and protect water-supply infrastructure. Under the authority of these task force directives, water utilities serving more than 100,000 customers are required to evaluate their risk to a terrorist attack and submit that evaluation to the EPA. Grants have been provided by the EPA to assist with these vulnerability assessments. In December 2001, the U.S. Congress approved $345 million in funds for security at water infrastructure facilities. In 2002, the EPA began providing grants to support counterterrorism activities in the states and at drinking-water and wastewater utilities. 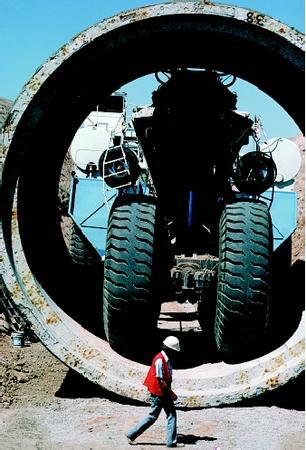 Large pipes are required to convey the high volumes of water needed for public water supply. Engineers determine the sizes of pipes needed based on the anticipated water-supply need of the population to be served. Security enhancements will continue to evolve in the water industry as more becomes known about detection and prevention of chemical, biological, and radiological attacks. The infrastructure of the country's water system should be a top security priority, not solely due to possible terrorist attacks, but also because of the critical nature of water itself in all facets of life in the United States. SEE ALSO Drinking-Water Treatment ; Economic Development ; Security and Water ; Supplies, Protecting Public Drinking-Water ; ; Utility Management ; Wastewater Treatment and Management ; Water works, Ancient . American Society of Engineers. Renewing America's Infrastructure: A Citizen's Guide. Washington, D.C.: American Society of Engineers, 2001. Cech, Thomas V. Principles of Water Resources: History, Development, Management, and Policy. New York: John Wiley & Sons, 2003. Drinking Water Security and Protecting Small Water Systems. National Drinking Water Clearinghouse, National Environmental Services Center. <http://www.nesc.wvu.edu/ndwc/ndwc_protect.htm> . Security and Preparedness Resources. American Water Works Association. <http://www.awwa.org/communications/offer/secureresources.cfm> . Water Infrastructure Network. <http://www.win-water.org/> . Water Infrastructure Security. <http://www.epa.gov/safewater/security/> . Pipe leakage is inevitable as pipes age, soils shift or freeze, pipes are broken during construction projects, or new land uses put increased pressure on buried pipes. Public water systems compare water amounts leaving the plant with metered water usage and water used for flushing mains. Greater than 10 percent of unaccounted-for water loss will trigger a search for the leaks. Broken or leaking pipes may allow bacteria to enter the distribution system. Not all water systems are metered and therefore are not able to accurately evaluate the extent of water loss. Many small water systems that do not have individual meters on households charge a flat rate, independent of use. Not only may this lead to undetected leaks, but the flat rates do nothing to encourage conservation of water. Older cities sometimes have spectacular waterline breaks. For example, in January 1998, a 48-inch, 128-year-old water main burst on Fifth Avenue in New York City, flooding several streets with a foot of water, creating a 35-foot-wide crater, and rupturing gas lines, which then ignited and shot flames two stories high.